The first time you buy blank DVDs or choose a DVD recorder, you can be so confused with all the similar DVD formats, like DVD+R and DVD-R. DVD+R and DVD-R may look identical, but they are different and competing standards for recording on DVDs. The difference between DVD-R and DVD+R is not so important for DVD players because virtually all modern players are compatible both formats. But the difference is important in DVD recorders. 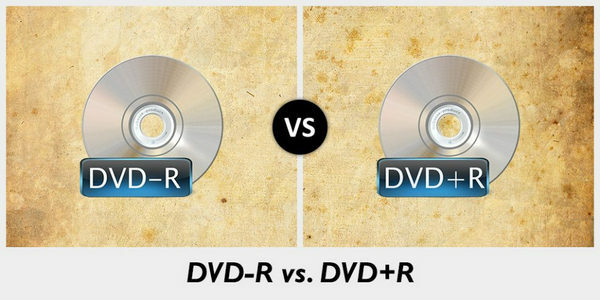 All being said, what is the difference between DVD-R and DVD+R formats? Which format is better? Read on and you'll find the answer. Superficially, DVD+R and DVD-R discs look identical. They're both 120 mm in diameter and 1.2 mm in thickness, comprised of two polycarbonate substrates, 0.6 mm each, except a DVD+R have "DVD+R" written on the disc, and the same with DVD-R discs. The main difference between DVD+R and DVD-R mainly focus on the formatting features, origin, etc. The DVD-R (pronounced "DVD dash R") format was developed by Pioneer and was released in the second half of 1997. Companies that support DVD-R include Pioneer, Apple, Toshiba, Hitachi, and Panasonic. In addition, this format is supported by the DVD Forum, which is an industry group that controls the use of the DVD logo. The DVD+R (pronounced "DVD dash R") format was developed by Sony and Philips and was introduced in 2002. Companies that support DVD+R include Philips, Dell, Sony, HP, and Microsoft, who formed the DVD+RW Alliance. What's more, most of these companies now develop hybrid DVD drives that support both DVD-R and DVD+R formats. The main functional difference between DVD-R and DVD+R is the way they determine the location of data on the disc. With DVD-R, little marks called "land prepits" are positioned in the grooves of the disc that determines how the DVD reader processes the information on the disc. DVD+R, however, does not have these "land prepits," but instead measures the "wobble frequency" as the laser processes the disc. DVD-R discs are usually cheaper than the DVD+R format. Dual layer discs are more widely available in the DVD+R format. Both single and dual layer DVD-R discs are available, but less variety for double layer DVD-R discs compared to DVD+R. 4488 MB for single layer; 8.5GB for dual layer discs. 4488 MB for single layer; 8.5GB for dual layer discs. Part 2. Which one is better? DVD-R or DVD+R? 1. Instantly eject without having to wait for finalized formatting. 2. Ability to record one DVD disc partially on PC and partially on television. 3. Background formatting: while the disc is being formatted, you can simultaneously record on already-formatted portions of the same disc. 4. Enhanced ability to edit filenames, movie and song titles, and playlists. 5. 100% compatibility with all other DVD players, while still enjoying these extra recording features. After learning about the difference, here we would like to recommend you the best DVD Burner software in case you need to create DVD disc. You can make movies to various DVD types, like DVD-R, DVD+R, DVD-RW, DVD+RW, DVD+R DL, DVD-R DL, DVD-5, DVD-9,etc. and play them on any DVD player. Burnova is the professional DVD burner, which creates local videos from computer or downloads and makes online movies from YouTube to DVD disc/ISO/folder. Burn video to DVD disc/folder/ISO file. Support DVD-R, DVD+R, DVD-RW, DVD+RW, DVD+R DL, DVD-R DL, DVD-5, DVD-9,etc. In this article, we mainly gave you a brief introduction about ConvertXtoDVD, including the reviews of ConvertXtoDVD and how to free download it. We have showed you how to use ConvertXtoDVD to burn videos to DVD. If you perfer other DVD burners, we also provided you a better option called Burnova. Still have more questions about Burnova? Feel free to leave your comments down below. Looking for the best free burning software to help you burn audio CD? This article introduces to you top 7 free CD/DVD burner. Play Blu-ray disc, Blu-ray folder, Blu-ray ISO file and common media files with Blu-ray Player. Looking for a great trailer maker to make movie trailer? This article introduces the best trailer maker.